To exhibit wit and skills in Mathematics, the pupils from Grades 4 to 6 joined the activities of Mathematics Week on September 10 – 14 with a theme, “Mathematics… Learn it, Live it, Love it”. The Math Wizard competition was the highlight of the events. Samantha Nicole C. Liwanag of 4- Rubidium, Marian Lovie A. Francia of 5 – Stradium and Matt Karl Randell B. Magnaye of 6 – Tantalum, victors on First place while Jacob Emmanuel B. Uy of 4 – Europium, Rjay Neil D. Bañas of 5 – Silicon and Rey Marvin C. Rizal of Tungsten bagged the Second place and Klyde Steeven C. Manalang 4 – Europium, Denver a. Jimenez of 5 – Strontium, and Simund Peter S. Tibule of Thulium earned Third place respectively. Grade 5 and 6 pupils solved Mathematical operations while playing DaMath. Michael Ryan V. Paglicawan of 5 – Scandium and Walfred Wayne P. Zurbano of 6 – Thorium grabbed the First place, Ritch C. Martel of 5 – Stradium and Julius Ceasar C. Abao of 6 – Thallium won the Second place and Abdullah P. Abdul-Raziq of 5- Silver and Matt Karl Randell B. Magnaye of 6 – Tantalum won the Third place. 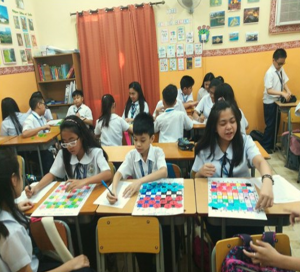 Grade 4 pupils showed wit and creativity in their Modulo Art wherein Adrian T. Cabangon of 4 – Radon bagged the First place, Jessamaeh G. Ostan of 4 – Rhodium garnered the Second place and Elaizah Novy I. Fontelo of 4 – Ruthenium won the Third place respectively. Math Week celebration was completed with a culminating activity and awarding of certificates of participation and recognition to all qualifiers and winners on September 28 at the Multipurpose Hall in Building D.